Turkey’s ruling Justice and Development Party (AKP) has formally requested an annulment and rerun of Istanbul’s mayoral elections through an extraordinary objection filed to the election authority. A Reuters report on Tuesday said the Ali Ihsan Yavuz, the AKP’s Deputy Chairman, submitted his party’s appeal for the annulment and renewal of the vote to the Supreme Electoral Council (YSK) on Tuesday and pointed out thousands of votes had been impacted by voting irregularities. “There is clearly organized unlawfulness, an election fraud here. The only authority that can end this controversy is the YSK,” Yavuz told reporters in the capital Ankara. He claimed if all of the votes in Istanbul had been recounted, instead of only the ten percent, the election would have resulted in AKP’s favor. “The recent events show how people’s will can really be destroyed. There are so many reasons for us to think organized election fraud took place. This will be on Turkey’s agenda for some time,” Yavuz said. He further said the gap between the main opposition Republican People’s Party (CHP) candidate Ekrem Imamoglu and his AKP rival, former Turkish prime minister Binali Yildirim fell to 13,900 votes from around 28,000 as a result of the recounts. “I think YSK will set people’s mind at rest with its ruling [on Istanbul] and it will avert this organized election fraud,” Yavuz stated. 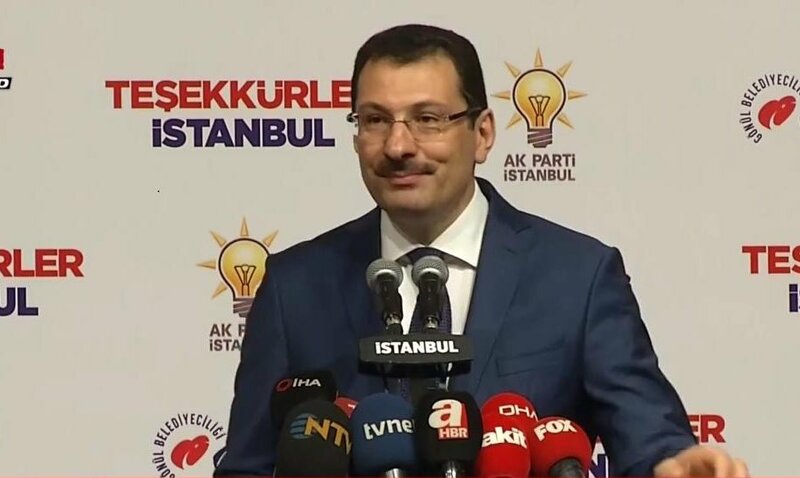 Bayram Senocak, AKP’s Istanbul Provincial Officer, said the party also appealed to the provincial election board and demanded it doesn’t give Imamoglu his mayoral mandate before YSK announces its decision over AKP’s extraordinary objection. Officials from the AKP were pictured carrying three suitcases, reportedly holding evidence of the alleged election fraud, to the YSK offices. The AKP has already lost control of Ankara and other key cities after the March 31 local elections. The Defeat in Istanbul, where President Recep Tayyip Erdogan was mayor in the 1990s, would be an even greater setback to the president. The AKP has filed numerous appeals for vote recounts across Istanbul in the 16 days since the election. The YSK has approved some of those objections, ordering partial or full recounts in several districts. If the YSK accepts the appeal for the annulment and renewal of the Istanbul polls, a second election will take place on June 2. If rejected, the results would be finalized and the CHP’s Imamoglu would receive his mandate as mayor.